A client in Orlando Florida recently constructed a new home in need of more backyard space including a retaining wall, paver deck, landscaping, and outdoor lighting. The home landscape design in Orlando Florida was in need of privacy, and more room for entertaining and enjoying the pool. The yard designer and their team started by carefully excavating soil and installing a decorative retaining wall. This provided more seating and deck space. Travertine stone pavers were then installed to expand the existing deck and provide more room for guests. The BLG team then installed clumping bamboo that provided instand privacy with softness to balance the hardscape. Organic mulch was placed around all plants to hold moisture and reduce weeds. Drip irrigation was then installed to ensure hydration to all plants. 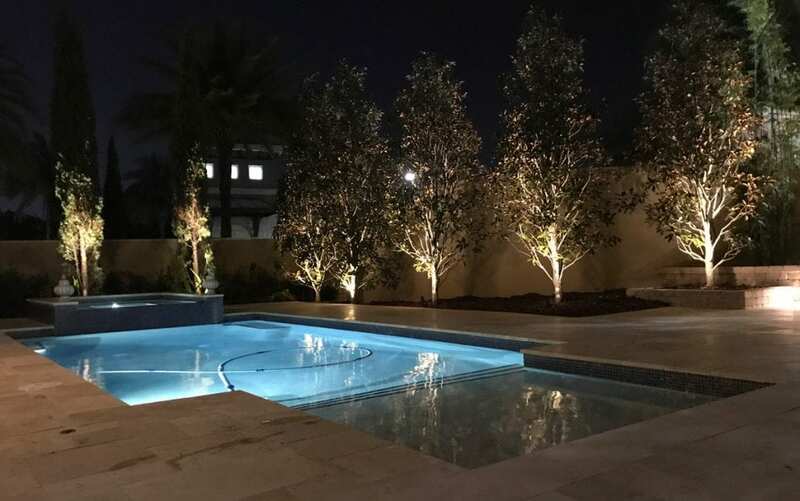 Finally, the backyard design team installed LED landscape lighting on all focal points including deck lights inside the retaining wall to bring the property alive at nighttime gatherings. With new design ideas implemented on this home landscape design Orlando Florida property the family will enjoy years of entertaining and artistic enjoyment day and night. If you have an Orlando Florida home in need of more entertaining space call BLG today! Copyright ©2019 BLG Environmental Services. All rights reserved.